Electrics are part of building regulations whether you are getting a complete rewire, making significant alterations or having additional installations fitted. Faulty electrics can be a serious fire risk or can even cause electrocution. So obviously it is very important to ensure that all your electrical installations and appliances fall within current regulations and even more importantly are not putting your home or family at risk. If you are planning on moving into a new home which is older than 30 years old it is important that you get the electrics checked out. Getting your home rewired can be a messy job so it is crucial that if you are moving into a new property that you get the rewiring done before considering any redecorating or re-plastering. 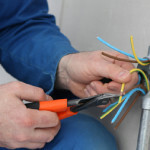 When is it necessary to have your home rewired? If you are getting a house extension or converting one or more of the rooms, for example getting a roof conversion or converting a garage into a new room, you will need to have an electrician check that the electrical work meets the current standards. If your current home electrics have not been upgraded in the last 25 years then they will need to be checked out to ensure they meet current standards and regulations. If it is over 25 years old it is highly likely that you will have to at the very least, need a part rewire. Electrical safety will need to be checked and improved to make sure it can carry current loads, it is earthed properly to meet current standards and that cross bonding satisfactory. 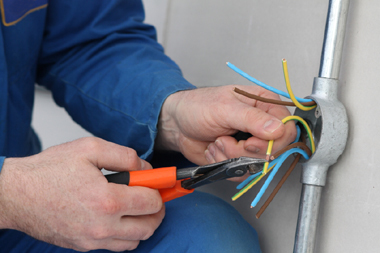 AMP Electrical will split your home rewiring in to first and seond fix. . First fix involves all of the wiring or rewiring, including but not limited to circuits and back boxes for power, lighting , burglar alarms, smoke detectors and doorbells, plus telephone, television. Sometimes a full rewire of your home can be avoided provided the cabling in place is in satisfactory condition and able to carry the current loads. It may also be possible to upgrade the consumer unit and cross bonding with something more modern thus avoiding the high costs of a full rewiring. Contact us today to discuss this further. At AMP Electric Belfast we will usually start any rewiring work at the same time as the plumbing and central heating is being installed. If the house requires new cabling, floorboards will need to be uplifted and usually skirting boards too. If possible you should have this electrical work done before moving into your home as this work will cause major disruption. The price will be calculated using measured rates according to how long we expect the work to take, how many circuits there are and the number of power points, light fittings and switches. We will also take into account whether the work is a new build or extension, in which case we can just face-fix the circuits, or a renovation, in which case we may have to lift floorboardss and remove plasterwork to conceal the wiring which, therefore, takes longer and costs more.